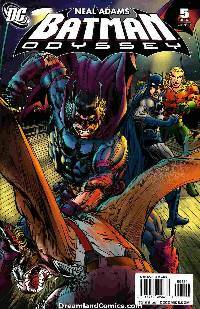 Batman knows his Odyssey must happen soon before he loses himself, but Deadman invades The Dark Knight's world and only sees the inevitable crash and burn of his old friend. Should Deadman add to Batman's "crash" – or hold off and give the Caped Crusader a few last moments of relative peace? This is Deadman we're talking about – of course he's going to step in! Oh, and there's one more thorn in Batman's side – in this issue, The Joker arrives!